Mindfulness meditation can help both therapist and client stay in the present moment and make the most of treatment sessions. This new and unique approach will allow you to employ the healing power of mindfulness in session for better client outcomes. If you're a psychotherapist interested in implementing mindfulness practices into your therapy sessions, The Essential Guide to Mindfulness Meditation in Psychotherapy is a comprehensive manual to get you started. 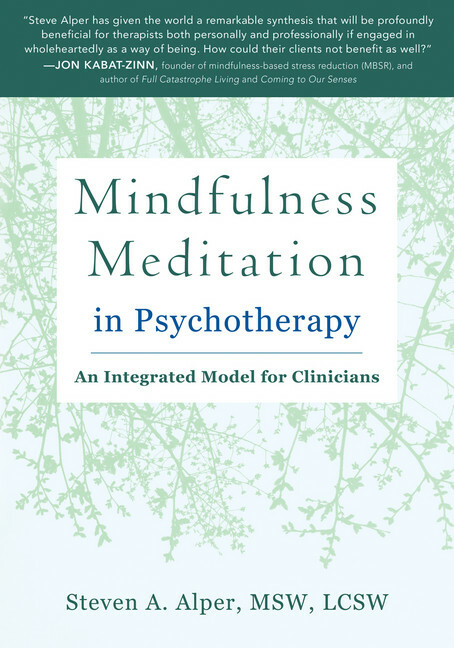 In this book, psychotherapist Steven Alper presents the mindfulness pyramid model: a multi-dimensional and graphic model for implementing mindfulness in psychotherapy. This practical guide will help demystify mindfulness meditation; elaborate on the psychotherapeutic benefits of practices such as body scan, breath awareness, sitting meditation, and lovingkindness; and offer helpful strategies for teaching formal and informal mindfulness skills to clients. This book conceptualizes and explores the applicability of his mindfulness pyramid model, and delves into the many ways in which mindfulness can manifest and be incorporated in psychotherapy. This is a must-have resource for any therapist. Steven Alper has been both a psychotherapist and a meditation practitioner for 36 years. He has taught MBSR for 24 years, and established the first MBSR programs in Southern California in the Outpatient Clinic of the UCSD Department of Psychiatry and at Scripps Clinic in La Jolla, where he was program director and senior instructor from 1995-2005. Since 2005, in addition to his private practice, he has taught mindfulness to mental health and health care professionals nationally and internationally.